Last night, I hardly slept at all. Seriously, I only had about two and a half (2 1/2) hours sleep! If you know me well, or if you are a reader of Life with Lynnie (LwL) you're probably aware that I sometimes have trouble sleeping. While some people think this problem is linked to being a widow, I know that I've had this problem for much longer. In fact, during my now deceased husband's mind changes due to having an inoperable brain tumour, I found I hardly slept, then. And, when I did, it wasn't a deep sleep. I felt I had to be awake in order to make sure he was okay. After all, he did have a habit of leaving our apartment, at times and I was concerned for his well being. Still, there are times when I sleep well. Usually, it is due to being so over-tired, that I just conk out! I believe that there is a reason I hardly slept at all, last night. Today, is a special day, here in Ontario, Canada. It's the first day of school! Well, my brother Glenn, who died a couple of years ago, was on my mind. Even though his birthday isn't until a few days from now, I recall the day he was born. Glenn was born on the first day of school! The Tuesday, after Labour Day. How could I ever forget this?! Because my mom had been in hospital, a cousin of ours, looked after my elder brother, and I. She was older than us and got us ready for school and sent us off, for the day. In this era of life, we attended school where we had to wear a school uniform. Today, some schools call their clothing choices, uniforms. I beg to differ, with most of them. After all, uniform means... one... as in uni... one!! It seems that schools I am familiar with here in my area, should be calling the clothing requirements not uniforms, but rather, school wardrobe. Especially since they allow pants in this colour or another choice to be worn. Shirts and tops of this colour and style or that colour and style, sweaters in this style and colour, or another, and skirts of this type or that, offering choice selections to be worn. This is a wardrobe, not a uniform. In any case, my uniform was to be a navy tunic, with white blouse, and navy socks. In fact, here's a photo of what I looked like, in my uniform! Here I am as a child, dressed in my school uniform! 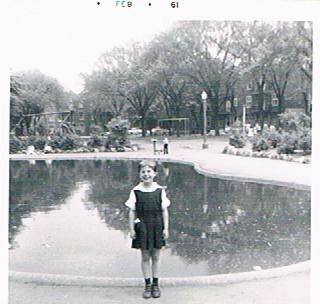 As I said, this was my uniform, that was completed by wearing a set of bloomers, underneath, so that on days when we had our gym class, all we had to do was remove our tunic, and we were already dressed! In any case, on the day Glenn was born, my cousin handed me a pale blue blouse, instead of a white one, to wear to school. Upon arriving at school, I wasn't even allowed to enter my classroom. I was directed to the office, where I was given a letter and was immediately sent home. The letter said I could not return to school, until I was fully dressed in my school uniform! So, on every Tuesday after Labour Day, I think of this. And, I think of my baby brother, who I thought was the most beautiful baby ever born. At least, until my own family came along! Of course, as an adult, saved by grace alone, through faith alone, in Christ, alone... I know that beauty is not truly skin deep. This reminds me of 1 Samuel 16: 7, "But the Lord said unto Samuel, Look not on his countenance, or on the height of his stature; because I have refused him: for the Lord seeth not as man seeth; for man looketh on the outward appearance, but the Lord looketh on the heart." Yes, God doesn't look at our physical body for beauty. I praise Him for this, especially since my lack of sleep sometimes affects my physical appearance! Instead, He looks at our heart. And, He knows what is in our heart. He knows just how much we love Him. And, since some of us are not perfect people physically, I am truly grateful for this. For, He knows I truly love Him! Hopefully, you do, too!